Thanks for sharing and I can tell you put a lot of work into the game. Very professionally put together and pretty clear to follow as well. -Theme is fun and executed pretty straightforward without overcomplicating the idea. -The main mechanic of firing from your tanks and using abilities is satisfying. -The quick jump in and out gameplay is ideal for mobile play, since the button mashing is hard to sustain over time. -Abilities and upgrades are fun to use. -Art/Audio is clear and services the game well. -Touch mechanics to fire mostly works well with rapid multi touch supported, but I definitely ran into problems if I wanted 2 tanks next to each other on iPhone to fire at the same time. My thumbs are not big, but i could only get 1 of the 2 to fire at the same time. This made level 16 with the cacti very tough when I was trying to focus on keeping both tanks next to each other alive. Would be good to work on hit detection boxes for input here or find a way to graphically space the tanks further apart so that this mechanic is possible. -What triggered end game failure was a bit unclear. I thought if you lose all 5 tanks the game ends, but new tanks respawn right away. Sometimes I could finish a level with a couple of tanks left, other times it said I failed as the new tanks had come into play. It was hard to feel tense or positive about my progress because of this. -Power Ups should be labeled as one time use purchases. I thought the downward swipe powers were permanent load in options you could bring into levels because of how expensive they can be. Because of this, you are better suited in buying the tank upgrades first. -The every tank fires at once power up also had the label as not being available, but I could buy it with enough coins. When I did it said I purchased an armor upgrade, which this power up is not. -With the machine gun soldiers, it was hard to tell I was taking damage as I could hear gunfire, but didn’t see bullets hitting my tank on iphone, so it was sometimes confusing to know I was being hit. The big turrets and other enemy fire was easier to notice. Overall a fun mobile experience that would benefit from some additional polish updates to make the user experience a bit more friendly. Congrats! I think there’s a lot to like about Five Tank. There’s a lot of clever decisions made in the development of this game and while the game itself falls a little short, I’d like to see further development with this idea. I like the design in a way to create a hybrid shooting game/arcade game for a mobile platform. Having the tank row that allows you to cover the entire screen without worrying about left/right controls is pretty smart. Tapping on a tank to fire is natural and the slide to call support feels nice. The game falls short when using these base elements in the fuller stages. There’s little strategy to progressing in the game for the most part, everything comes down to how much you’re willing to wear down your thumbs tapping. This combined with the upgrade store means for the most part the game is about grinding and brute force. I think that’s a valid way to design the game, but I feel like there’s a lot of lost potential here. At the least I’d like there to be more rewards for better shooting or strategy. I think focusing on more unique enemy signifiers would deepen the game planning. For example the worms could have a warning where there is a lump that is visible in the sand before they emerge. This would reduce the seeming randomness of enemy placements and make the game feel more strategic. Even though the art is simple, I like the cleanness of the lines and the clarity of the sprites. The sound does it jobs and there’s not too many rough edges with the UI and game polish elements. I enjoyed Five Tanks quite a bit and would love to see further expansion of this core idea. Kudos on some smart design choices and I hope to see more development in the future. 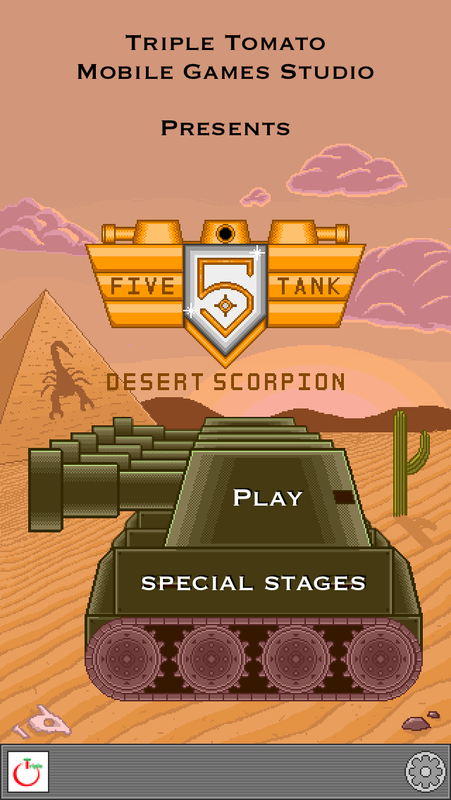 Our coming up game “Five Tank : Desert Scorpion”.